While I've known his name and face for years, I only caught brief glimpses of Rev. Kennedy on television. 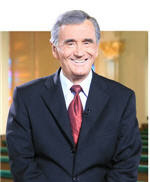 He always appeared to be an honorable man to me who preached the word of God. The Pastor died this morning after retiring just last month. RIP. FORT LAUDERDALE -- - Conservative leader the Rev. D. James Kennedy died Wednesday morning, sources at his Coral Ridge Presbyterian Church reported today. The pastor died "peacefully, in his sleep, at home" around 3 a.m., according to the Rev. Ronald Siegenthaler, executive minister at the 10,000-member church. By his side was Anne, his wife of five decades. Kennedy, who also founded a broadcast ministry, a seminary and an annual series of conservative conferences, suffered multiple complications ever since Dec. 28, when he suffered arrhythmia and cardiac arrest. He never fully recovered, despite a rigorous regimen of physical therapy in Florida and Michigan. His retirement was announced Aug. 26 by his daughter, Jennifer, who spoke at a joint gathering of all three Sunday services. The church also announced plans for a tribute to Kennedy's life and career, set for 11 a.m. on Sept. 23.